Failure to give transgender people formal legal status has affected their ability to access education, transport and social welfare. THE DÁIL WILL is today discussing gender recognition legislation for the first time ever. A report on the Gender Recognition Scheme is now being debated in the chamber. Last year, Minister for Social Protection Joan Burton launched draft heads for the Gender Recognition Bill 2013, which was the result of a finding that the previous government was in breach of the European human rights convention. The finding was based on a failure to recognise a transgender woman in her female gender and give her a new birth certificate. This left transgender people in Ireland without a formal legal status and affected their ability to access services like social welfare, education and transport. Speaking in the Dáil, Burton said the lack of legal recognition for transgender persons in this country is “a significant and long-standing issue”. Once enacted, the legislation will mean a person will be legally recognised by the State as being of the acquired gender for all purrposes. They will also be entitled to marry a person of the opposite gender or enter a civil partnership with a person of teh same gender. 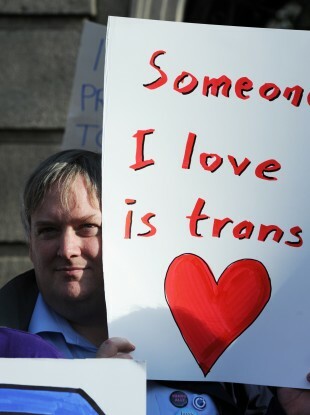 The Transgender Equality Network Ireland (TENI) described it as a “historic moment for trans rights in Ireland” and urged the government to adopt recommendations made by the Committee on Education and Social Protection which reviewed the general scheme of the legislation. “I am hopeful that this discussion will be robust and fruitful and may well result in tangible changes in the legislation that will benefit the transgender community,” TENI Chief Executive Broden Glambrone said. Email “Dáil debates gender recognition law for first time in history”. Feedback on “Dáil debates gender recognition law for first time in history”.